DarkMatter speaks out against transphobia and racism during the duo's spoken word performance at Parkes Hall on Sunday night. The South Asian art group brought poetry and discussion about nonconforming LGBT people to Northwestern as the student group Rainbow Alliance's fall speakers. 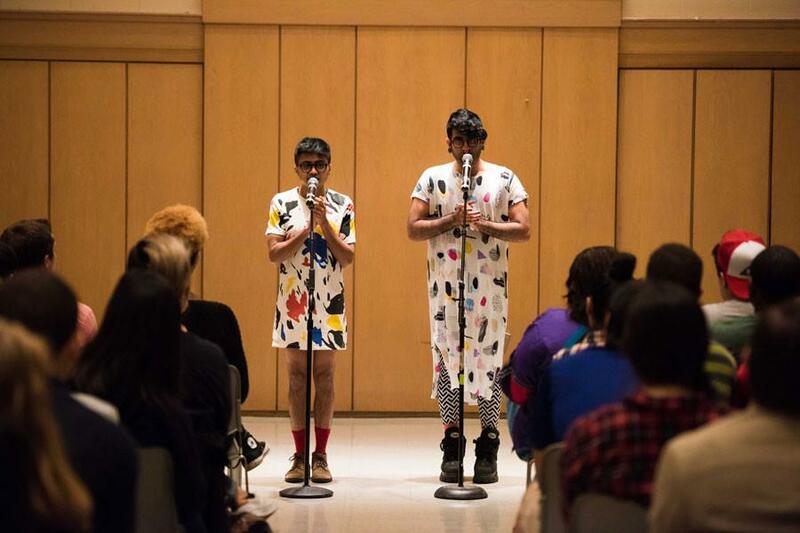 DarkMatter, a transgender South-Asian performance art duo composed of Alok Vaid-Menon and Janani Balasubramanian, performed their #ItGetsBitter spoken word poetry as Rainbow Alliance’s fall speaker Sunday night. The poetry performance was a wordplay on the hashtag trend #ItGetsBetter, which implies a progressive future of people believing society has reached an appropriate level of acceptance — and DarkMatter refutes that so-called reality, said Weinberg sophomore Sylvia Regan, Rainbow Alliance’s publicity chair. In their poetry, DarkMatter highlighted disparities in how gay rights are portrayed, versus the reality for nonconforming LGBT people of color. The duo also discussed problems in present-day colonialism, queer violence and LGBT exploitation from white society. Vaid-Menon and Balasubramanian’s first poem described fear of discrimination through the metaphor of crossing a road to illustrate the danger transfeminine people face. They also described problems with feminism and white supremacy. The event, attended by about 120 people, was followed by a Q&A session. Vaid-Menon and Balasubramanian responded to a variety of questions ranging from their poetry decision-making strategies to what they love about themselves. NU alumnus Rohan Zhou-Lee (Bienen ‘13) said the performance helped them feel affirmed in their work for a Chicago theater company to create a more inclusive art scene by bringing in a diverse array of artists. Zhou-Lee, who does not identify with a gender, said the most important takeaway was that the performance’s concepts were to-the-point and direct.